They’ve done it before, the folks at Pixar… turning a rat loose in a French restaurant to prove that anyone with gumption (and a little talent) can cook and impress a cranky food critic; allowing us to follow the near-silent escapades of two robots amidst their blossoming romance and the dawning of hope in a once decrepit and apocalyptic setting. Now, perhaps more difficult, they’ve outdone themselves by giving a broken-hearted old curmudgeon one last shot to find the spirit of adventure for both himself and a can-do, but lonely, boy scout. It’s rare that a contemporary animated film, outside of European efforts from artists like Sylvain Chomet or Japanese achievements such as those of Hayao Miyazaki, present such multi-faceted emotional work, but time and time again Pixar has proven that they can do just that whether their work is designed to entertain the mainstream or push the experimental envelope of what audiences will accept in an animated kid flick. Pixar is the name folks remember when discussing animated films that made an impact on them emotionally or just by way of a really great time at the movies. More than a brand, the Pixar name brings to mind a kind of timeless quality that other big American animation studios can’t seem to match. It’s a quality that makes each Pixar release seem like a masterpiece when weighed against the work of other studios’ efforts and the very high expectations that audiences now demand from Lasseter and company. 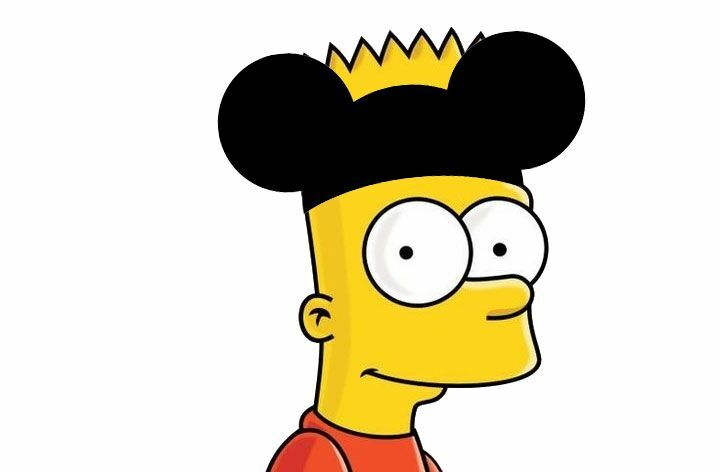 Though that quality now seems to be at risk of being fully corporatized since Disney purchased Pixar. There’s plenty of hope that the situation will be reversed and Pixar’s type of quality entertainment will inspire Disney’s animation unit to new heights in animation aesthetics while also creating a new generation of classics that stand the test of time. Up represents the last of a trilogy of Pixar films that marked a short period when they underwent a transition from being a Disney distributed boutique group of like-minded animators under John Lasseter’s consistent artistic vision (and Edwin Catmull’s technological guidance) to becoming the main computer animation division within the corporate giant. During that initial phase, and after years of experimentation with brilliant, sui generis short films, Pixar was able to produce kid-friendly mainstream movies that fit in nicely with Disney’s corporate mission; reinvigorating their financial bottom-line while also giving notice to the House of Mouse that a new era had begun with the success of Toy Story. Disney turned digital just as their relationship with Pixar began to sour due to Michael Eisner’s mishandling of negotiations with Pixar and Steve Jobs’ own unique brand of hubris. During the years where it looked like Pixar might sever ties to distribute their own films (as Canadian critic Peter Chattaway recently pointed out) they began to come up with ideas that didn’t necessarily play to the smaller set or fit in with the Disney typically risk-free formula for cinematic success. These films offered serious adult themes presented as light family comedies and offered unique ways to break with standard narrative conventions. These are the films that allowed Pixar’s story and animation departments to truly stretch their CG storytelling techniques, playing with narrative style, pace and tone, resulting in Pixar winning the Academy Award for Best Animated Feature three straight times (a record currently unbroken) as well as having Up nominated for Best Picture, only the second time an animated film has been rewarded by the Academy for that top-award since Disney’s own Beauty and The Beast over a decade earlier. While there’s no telling where Pixar might go next— an upcoming slate of features save for Newt seem to play it safe with another Toy Story sequel and Cars 2 being readied for release— Up truly represents the best of what these talented folks and their technology can do, though it won’t be long before another film, perhaps not even made by Pixar, goes further artistically. The key attraction of Up is not so much the wild yet realistic visuals, but rather the story… Up tells a tale that nearly anyone can relate to: a tale of a man’s life and dreams, his marginal successes and his disappointments, and it’s a love story where for the better part of the film a significant character remains only as memory, a benign spirit in the form of a simple home. Carl Fredricksen (Ed Asner) is a cantankerous 78-year-old coot who some might assume created the phrase, “get off my lawn you kids!” He lives alone after retiring from the balloon business and the recent demise of his true love and companion, Ellie. Presented initially as curious, risk-taking children, Carl and Ellie dream of adventure in far-off Paradise Falls, South America where their hero, the recently discredited explorer Charles Muntz (Christopher Plummer), has gone to pursue the discovery of a 13-foot tall bird that may or may not exist. No matter, for the spirit of adventure, which also happens to be the name of Muntz’s airship, is infectious and details matter little when you can rig up an old house with imaginary sails and fly off to faraway lands. Carl and Ellie find Muntz’s adventures irresistible, just as they find each other to be a perfect companion for their youthful exploits. Over time this develops into love, though in Pixar’s economy of storytelling, this entire meet-cute sequence (and a preceding newsreel set-up that’s spot-on in every detail) lasts just over seven minutes of screen time. Following that is an emotional tour-de-force showcasing the married life of the slightly mis-matched pair whose bond comes directly from their shared passion for a potentially adventuresome life… only thing is, life then gets in the way of their dreams. Any hope of reaching Paradise Falls slowly recedes as Carl and Ellie work, love, and live while dealing with everyday issues that drain their finances and push their goal further away, causing them to nest rather than fly. It’s not a bad life at all and the mundane aspects of a life lived together have an undeniable charm… they support each other through good times, sad times and a childless life, always managing to make each other smile, finding enjoyment in the small pleasures of existence. After cleverly showing the passage of time by having Ellie tighten the knot on a procession of Carl’s daily ties, married life segues to their golden years, still together but slowing down physically. Carl, understanding that their time is short, becomes determined to make their dream a reality before— but it’s too late… Ellie fades from his life, but not his heart. It is truly one best cinematic sequences of its year, or just about any other, and it proves that Pixar is not averse to taking narrative risks even within a family action-comedy. This stunner of a sequence, silently told in the best cinematic tradition and accentuated only by Michael Gianccino’s whimsical, yet poignant score, left hardly a dry eye in the house during Up’s theatrical run. 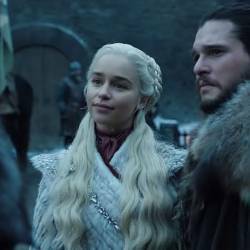 It’s a well earned-moment, for the series of marital vignettes never feels the least bit manipulative and allows us insight into who these people are, and why we should even care about a couple of old geezers. Had Carl been introduced without this rich backstory (less than five minutes long!) the old curmudgeon that he becomes once Ellie passes would be nearly impossible to consider as the hero of the movie or a candidate for redemption. The story quickly introduces comic elements indicative of old age and a society that finds the elderly (and virtually everything they created and stood for) disposable. Carl can only stare from his porch at the changes for which he cares little, and people for which he cares not at all. He feels powerless… growling and grumbling to get his point across to the virtually faceless developers across the street, or the workers who seem oblivious to his existence except for the fact that he’s slightly in their way and will probably have to be moved. Carl makes an emotional, yet rational, mis-step in public relations and soon finds himself on the verge of losing both his independence and his home, which in many ways represents his last bond with Ellie and their life together. Before he must leave for Shady Oaks Retirement Village, Carl meets Russell (Jordan Nagai), a local boy who is part of the Wilderness Explorers and is out to earn his “Assisting the Elderly Patch,” without annoying the elderly in the process. 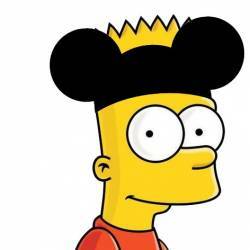 Russell is quasi-confident… an adventurous spirit though his practical sense might be lacking at times. Nevertheless, his gusto goes a long way toward showing Carl how to recapture his own lost spark. In turn, Carl realizes that Russell is searching for meaning amidst sewn-on achievements in lieu of strong parental figures… above all he misses his father, an absentee figure that all but offers Carl a vacuum to fill in the boy’s life. As this is a Pixar film it’s an important strand of plot that’s meant to bring depth to the character rather than an excuse to muck about in maudlin manipulation…. it’s gently introduced in conversation, then easily dropped as Russell’s upbeat, can-do attitude comes shining through when the going gets tough. 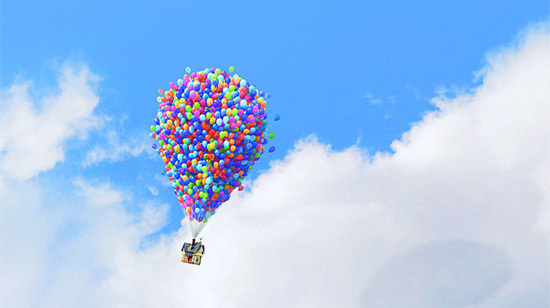 Their adventures in Carl’s flying house (bringing to mind some of the best of Miyazaki’s spirited whimsy), achieved with a riot of colorful balloons wonderfully rendered by Pixar’s artists, lofts us away to further escapades among the clouds, treacherous storms and beautiful landscapes of South America. Here the filmmakers introduce a shift in tone similar to the way Wall-E transformed from Buster Keaton-type comedy amidst an apocalyptic wasteland to a space-faring adventure and a race against time. Some criticized Wall-E for having a brilliant first half that then seemingly devolved into typical chase fare and slapstick action, and many have pointed out that Up makes a similar blunder, transforming quickly from being a touching film about loss and recapturing one’s dream to an action-packed boy’s life snipe hunt. 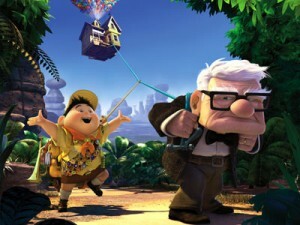 Perhaps one could look at it that way, but I feel Pixar never crosses the line into cheap thrills or easy comedy in Up. 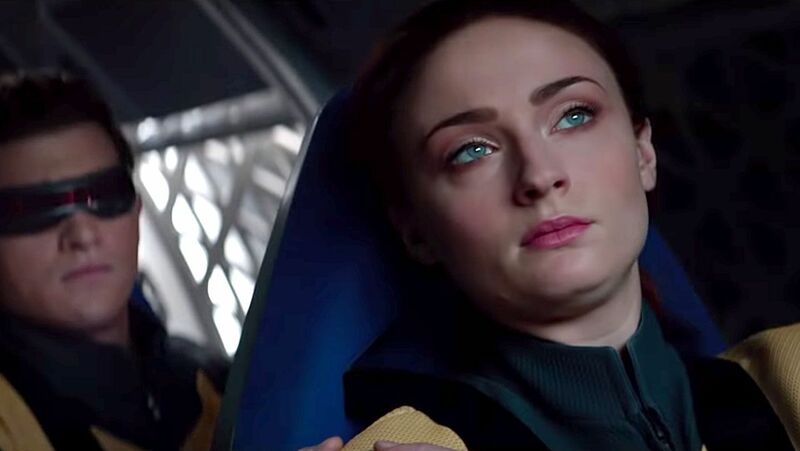 I’ll argue that without an arc of drama from crisis, these films don’t have anywhere to go except the purely experimental at the detriment of leaving mainstream family audiences in the bewildered… without an entertainment aspect people can relate to the films become esoteric exercises in narrative subversion. Oh, don’t get me wrong, Pixar always manages to be pleasantly subversive, but they are smart enough to know when to back off. They refuse to let their art become elevated to the point where it no longer serves story or character… and yes, plot, too. 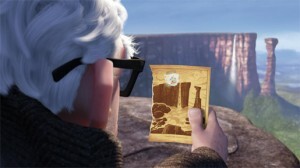 What triggers the adventure in Up is a bit similar to the MacGuffin device of finding the last viable sprout in Wall-E. The search for a rare, flightless bird is essentially a snipe hunt. Literally. Carl gives Russell instructions to find a “snipe,” laughing under his breath at the kid’s gullibility as he sends him on this fool’s errand, and yet Russell finds it. After they realize it’s endangered by Muntz’s delirious desire to find it himself (for dubious ends), and after coming to terms with a threat on their own lives for protecting it, Carl makes a crucial decision and joins with Russell to protect “Kevin” the snipe. Here is where the action really kicks in, and granted the film does at times feel like it might head off the rails with the introduction of a pack of intelligent hunting dogs owned by the mysterious Muntz as well as borderline absurd chase sequences (that are pretty intense regardless), yet directors Pete Docter and Bob Peterson make a point of not allowing the canine thugs, the airship battles or Muntz himself to distract from the central story. While the filmmakers toss in lots of frenetic excitement in Up’s second half, those moments are always designed to serve the story and expand Carl’s character, giving him a chance to recapture his spirit of adventure within a suitable arc of drama, tension and thrills. The artists at Pixar do an astounding job in rendering the almost alien landscapes of Venezuela’s remote mountaintops and waterfalls, and it is a fitting place for the staging of those aforementioned action sequences, among some of the best Pixar has presented since The Incredibles. 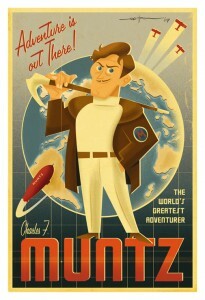 Muntz, coming off like an elderly Errol Flynn with Kirk Douglas’s sharp features, is a ruthless character at times… a man whose quest for rare objects has darkened his heart. The scenes of him putting Carl and Russell in jeopardy have an intensity and meaning to them that the actions of stock villains often lack. 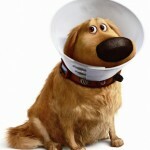 In fact, the last half of the film could have easily tipped over to the darkside were it not for Dug, the talking dog. A talking dog you say…? How typical of Disney! But Dug is not your typical Disney anthropomorphic creature— he doesn’t really talk, but has his thoughts electronically transmitted as vocal sound. This gives the Pixar folks a quasi-realistic way to let Dug offer up some funny material while eschewing the kind of saccharine sweet comedy one might expect from talking animals. Dug walks and barks like a dog, does everything a dog would naturally do, but is also able to express his canine self (SQUIRREL!!) in a variety of languages via a special, Muntz-designed collar… without it, he’s just a loveable mutt. Those thoughts are at times innocently naïve and just simply lovable enough to allow Dug to stand apart from the rest of Muntz’s vicious pack and their Alpha leader. Muntz’s creation of these henchmen, er—henchdogs— each with a communication collar of their own, allows the film to showcase a dog’s life (and point-of-view) without shattering the cinematic reality of the characters and situations we’ve seen previously. No matter how fantastic and weird things might get during the second half of Up, the characters and situations always seem as real and emotionally tangible as an animated film can deliver. Up is remarkable for so many reasons, but it works (and succeeded in its theatrical run) for the simple pleasure of seeing Carl and Russell cast off the past and find themselves rejuvenated through a new paternal friendship. Carl finds new strength in passing on his love of adventure to the boy while learning new things himself— some extraordinary, some mundane, like the simple joy of counting cars passing by while sitting on a sidewalk eating ice-cream— from Russell. Through all this, Carl never loses touch with the love of his life, Ellie, yet he is willing to let her become fond memory rather than a safety zone to retreat into. Up has all the hallmarks of a timeless classic, with none of the pop culture crassness and easy fart-joke humor of so many other animated films and CGI kiddie-flicks. With nary a forgettable pop song to spoil the mood, Michael Giacchino’s Oscar-winning score (and rightly so! ), evokes an old-time sensibility for Carl while also adding additional heart-thudding excitement during Up’s rousing action sequences. It’s just another example of the efforts that, on the whole, make Up another masterpiece for Pixar to be proud of, and a must-see for any lover of cinema. 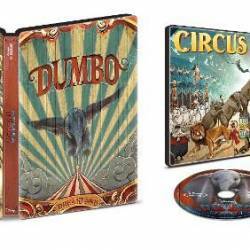 If you missed it in theaters (it played in 3D and 2D) there’s no better way to see Up than on Blu-ray disc. 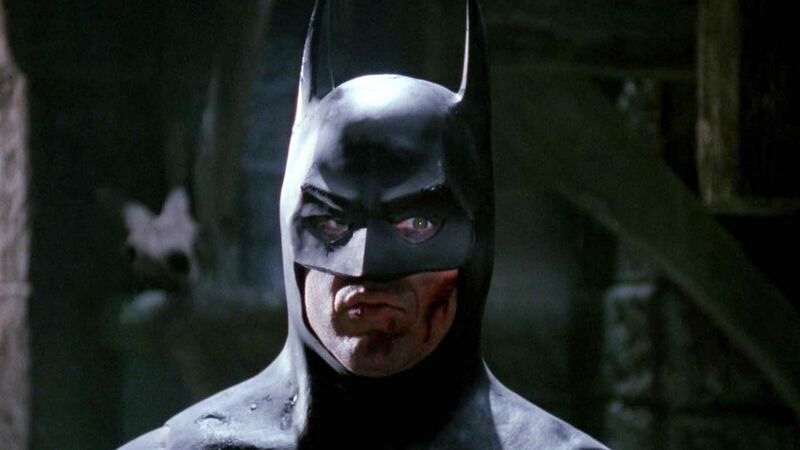 Though the DVD looks and sounds as good as it can, upscaling nicely via a standard player, it cannot compare to the astounding image and audio quality of the Blu-ray version. The 4-disc Combo Pack (BD + DVD with Digital Copy) offers a terrific set of extra features as well as a pristine copy of the film in high-def. 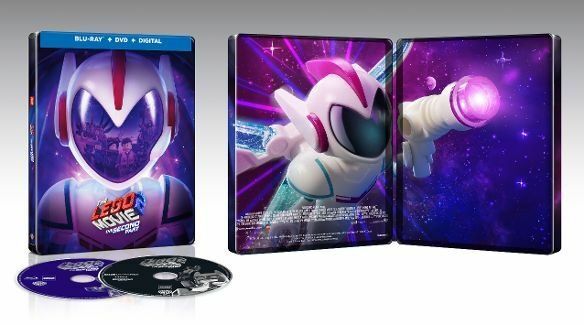 Since you get the DVD with the Blu-ray you can easily see the difference in presentation. The Blu-ray picture is tack sharp, perfect for computer animation and offers robust color and contrast with excellent black levels (the dimly lit scene when Muntz reveals his dark side is particularly impressive) and no noticeable digital enhancements. 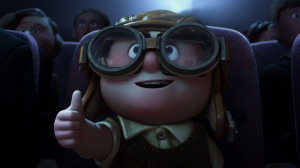 I saw Up in 3D during its theatrical run, one of my first viewings of a 3D feature other than Coraline at the time, and I came away with the same impression of Up in 3D as I had for the earlier film. While the gimmick added nicely to certain sequences (mostly action scenes) and gave a nice depth to the beautifully rendered landscapes, it also dimmed the picture noticeably, presenting a slightly desaturated image that left me feeling I was missing out on a more vivid 2D experience. That’s not quite how the 3D hype is supposed to work, and one at least hopes for a highly immersive experience without the limitations of the 2D image, and yet throughout the show I was aware what the image lacked rather than the 3D effect. On Blu-ray I felt I had a more enjoyable time with Carl and Russell as they made their way to Paradise Falls. 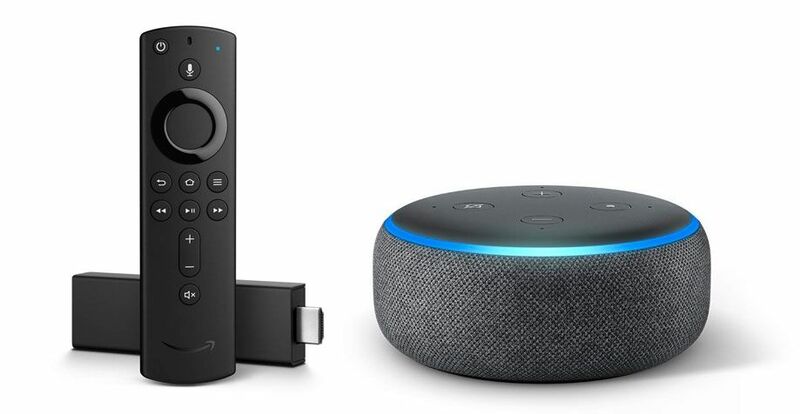 Though the image is quite sharp it doesn’t have a weird edged quality to it, and yet it offers a very dimensional experience via a big-screen home theater setup. As Carl’s home is lofted into the clouds, the sense of travel is nearly IMAX worthy coming from a good-sized HDTV. When Kevin the bird suddenly lowers his head, ruffles iridescent feathers and moves forward to display motherly aggression toward Carl (yes, this sentence makes sense if you’ve seen the film) the effect from Carl’s POV leaves you just as dazzled as if you’d seen it in 3D. The fact that Disney/Pixar did not offer Up in 3D for home video release (as Coraline had been) shows confidence in the film far beyond technological gimmicks. The 1080p/AVC/MPEG-4 widescreen image is breathtaking, with a level of detail that often had me in awe (and made my now 2-year old HDTV seem new again). Whether it’s the thin wisps of atmosphere hanging over the Venezuelan cliffs, or the old-man stubble on Carl and Muntz’s cheeks, the level of detail is astounding. I’d purchase Up for the reference disc quality of the video… you won’t regret it. 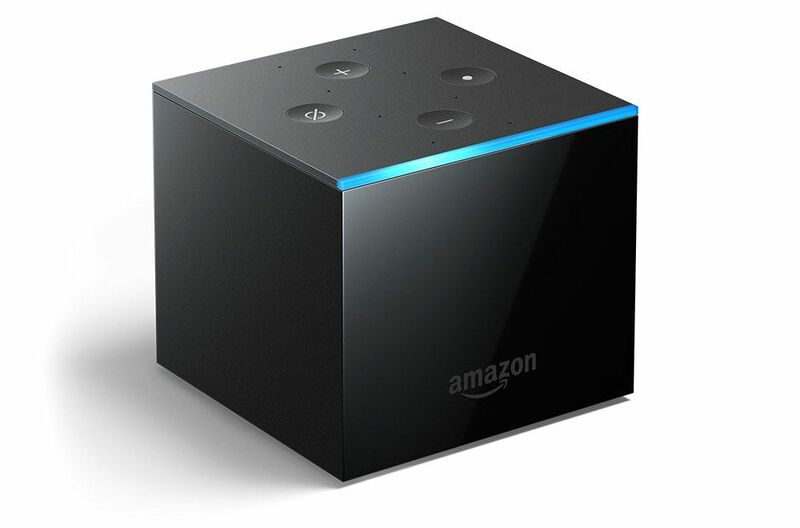 The audio provides an excellent lossless mix with DTS-HD Master Audio 5.1 ES Matrix encoding that fills the room with terrific ambiance and clarity of dialog. 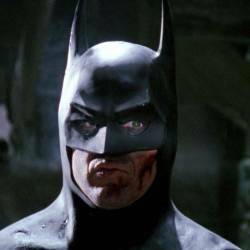 Even during the most clamorous action sequences, with the intensity of the score accompanying propeller noise, dog barking, a child’s screams, the dialog is mixed quite well and easily heard. However, Up is notable for just how quiet an action movie it is… with plenty of scenes that underplay the events onscreen. It’s another sign that Pixar is unafraid to challenge expectations about what a family film can be. 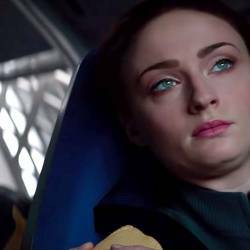 The aurally subdued moments allow plot and character to propel the action rather than a bombastic sound mix common to so many children’s action movies. 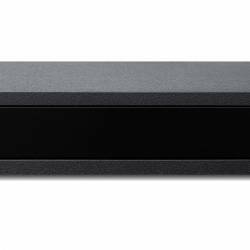 The BD version also offers French and Spanish DD 5.1 EX tracks as well as English DTS-HD 2.0 (great for smaller sound home theater systems that lack 5.1, use a Pro-Logic setting to get the best result) and an English DVS 2.0 track for the visually impaired. Subtitles are provided in English SDH, Spanish and French. 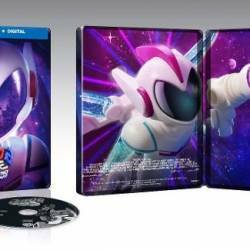 The Combo Pack breakdown for this release gives you one Blu-ray disc, a special features disc with all offerings in HD, a standard-def DVD and a disc entirely devoted to digital copies for computers and portable devices. 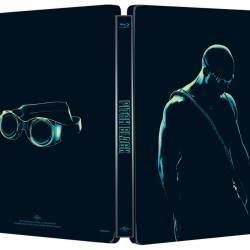 So, really, you’re getting a 2-Disc combo pack when it comes to hi-def Blu-ray features. Nevertheless, the Combo Pack is highly recommended for any Blu-ray library… whether you have kids or not. Cine-Explore (feature length) — The Blu-ray version of Up offers no traditional director commentary, but instead has a BD exclusive “cine-explore” feature integrated throughout the movie. Pete Docter and Bob Peterson discuss the original concepts for the film (one simple humorous drawing of an old coot with balloons led to an Oscar-worthy film) including character and story origins, character shapes, voice casting, the very idea of a floating house and how to make it physically possible (at least on screen) along with the various approaches the filmmakers took to the relationships between Carl and Ellie, Carl and Russell and other aspects of the film’s production. There are plenty of great early stage concept drawings and some preliminary CG animatics as well… it’s fascinating to find out how they manipulated all those balloons and they tricks they created to make the rendering of such images easier. 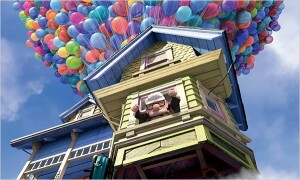 Up is a spectacularly beautiful film, and getting a taste of how it all came about is a real pleasure. Partly Cloudy (5:46) — Pixar always delivers terrific little theatrical short films… the kind of stuff they used to show before the feature in my parent’s day. This one was shown before Up during the theatrical run. I’ve enjoyed seeing how Pixar has matured over the years by viewing a succession of just their short films. 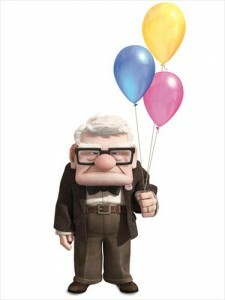 For instance, I had seen Geri’s Game, a Pixar short produced in 1997, and it was nice to be able to contrast how the Pixar artists portrayed old age in that short vs. the geriatric characters of Up. Even with better technology, the filmmakers took a less realistic approach with Carl, unlike Geri the solo chess player. I like to think of Pixar shorts as the studio’s way to work out problems in CG animation… in this case how to make better clouds. 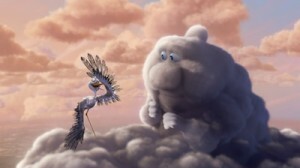 Up is full of clouds of course, and to capture the natural look of clouds I gather they worked out some of their ideas via this cute little film about a gathering of cloud-beings with the power to create all the creatures that populate Earth… it’s also about the storks that deliver those creations. One particularly frazzled stork gets stuck with an assortment of prickly animals and predators that threaten to make his work much harder than it needs to be… which raises the question: Should he fly off his cloud and find another that makes less stressful animals? The film is a charming effort though I thought their previous short, Presto, was a much better cartoon (in the best sense of the word)… Presto is like a machine gun of old-fashioned, rapid-fire laughs that could have been lifted straight out of a Loony Tunes short, whereas Partly Cloudy is just kinda cute and takes a lighter approach that, by the end, seems less memorable. Still, you can see the Pixar artists testing out new techniques in CG animation, and it’s always refreshing to get another little gem from everyone’s favorite animation studio, especially one that relies on dialog-free emoting to get the point across. Those pixels on the screen can really deliver the heartwarming goods when the right artists play around with them. Dug’s Special Mission (5:42) — In Up we have a sequence where, out of the mists on the Venezuelan peaks, Russell and Carl meet Dug and discover he can talk, sorta. This second short film is just a fun little Pixar treat showing the encounter from Dug’s point-of-view. It’s pretty appealing as a tossed-off bit of backstory, but again, not as memorable as the actual feature film it supports. 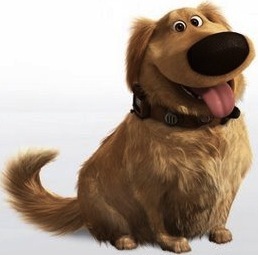 Always nice to see Dug though… he’s truly one of Pixar’s best creations, and the dog probably everyone wishes they had as a kid. He’s too lovable for words (ironically). Adventure is Out There (22:17) — Boy, if you’re working at Pixar, you’re like the luckiest kid person in the world! Not only do you get cool perks like the famous Cereal Bar, but you also get to travel around the world to do field research. Like, it’s so awesome that you got to visit Angel Falls and the tepui table-top mountains of Venezuela! Hardly anyone’s been there… Heck, you folks even got a helicopter to take you up and drop you off and you filmed much of it and took pics and did research and stuff, and wow, you guys are just so cool… I wish I could draw as well as you so I could go! All that research sure paid off though… Up’s backgrounds and landscape plates look unbelievably real and realistically unbelievable at the same time! Neato! Alternate Scene: The Many Endings of Muntz (4:56) — There’s a lot of ways you can kill off your villain, the difficult part is doing it the right way, especially if he’s one of those Snidely Whiplash types like Charles Muntz who’s more of an expert mustache twirler… sinister definitely, but not out-n’-out evil. Pixar’s artists came up with a variety of ways that affected the story differently each time, and here you get to see pencil animation and animatic tests of those trail and error moments. It’s impressive how Docter, Peterson and their fellow artists realized the importance of the Fredricksen house in representing Ellie’s spirit… and protected that idea from becoming an easy device to dispose of Muntz. Cooler still is their attempt at an ending for Muntz straight out of Kubrick’s The Shining. Family films that transcend their audience get weird that way sometimes. BD-Live — Not much to see here on this disc… move along, move along. Documentaries – Wow… just a ton of stuff on this disc and all of it quite interesting. Just getting an idea of how Pixar’s geniuses came up with it all is almost overwhelming and certainly adds value to owning the Blu-ray as a keepsake. Geriatric Hero (6:24) — Bob Peterson gets a chance to relate stories of his grandparent’s home and how it influenced the Fredricksen place, and to some extent the characters of Carl and Muntz. Part of Up’s charm is realizing that all the action in the last half stems from an old guy’s attempt to recapture a lost dream. Seeing Muntz and Carl battle it out while their bodies creak and groan in arthritic pain gives the latter half of the film much of its humor (and adds to its poignancy). In this feature you get plenty of character studies and pencil drawings that showcase Carl’s evolution in shape, style and mood. Not enough Ed Asner here though… as he really brings Carl to life, I was hoping to see more of his voice sessions. Canine Companions (8:26) — Dug and Muntz’s dogs get their due here… it’s neat to see how the animators studied dogs in order to make their onscreen behavior and movements appear realistic even if they happened to speak their minds. Russell: Wilderness Explorer (9:00) — Here’s Russell and Jordan Nagai, the rambunctious youth that voices his enthusiastic yearnings… Once again, we get a wonderful insight into how a pencil sketch becomes a fully emotional character that lives onscreen. The animators discuss various aspects of Russell’s shape and demeanor and here you do get to see some of the voice sessions with Pete Docter and young Nagai doing a few line readings. Our Giant Flightless Friend, Kevin (5:04) — The filmmakers explain how Kevin the bird is more or less their film’s “MacGuffin,” which is an old Hitchcockian narrative device to get the story moving… So, Kevin’s kind of like the briefcase in Pulp Fiction only she’s funnier and prettier onscreen. Homemakers of Pixar (4:38) — The house that Pixar built… Some interesting tid-bits about how they decided how the house would look through various stages of neglect, love and old-age. After Ellie passes, the house is what represents her continued spirit of adventure as well as Carl’s own literal Spirit Of Adventure once he makes it capable of flight. Balloons and Flight (6:25) — All the tricks of the balloon trade explained here, including the kind of party balloons that allow a house to take to the air and bigger balloons, like Muntz’s ginormous dirigible… that is to say his airship. Composing for Characters (7:37) — Here the documentary shines a spotlight on cinematic composer, Michael Gianccino and his extraordinary contribution to various emotional tones in Up. Gianccino explains how he crafted the newsreel music, Ellie’s expressive theme as well as other character themes and grace notes. As he won the Academy Award for best original score for this film, it’s worth seeing how he came up with his approach to Up’s melodic motifs. And if you look closely during the recording session moments, you’ll see a blink-and-miss shot of Pete Docter playing stand-up bass… just another musician pitching in his talent. 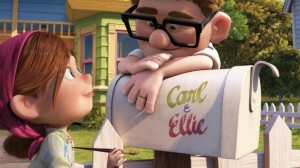 Alternate Scene: Married Life (9:13) — I’ve said quite a bit about this key sequence from Up. If the first half of Wall-E proved Pixar didn’t need dialog heavy action to make the audience laugh, cry and laugh again, then the “Married Life” moment in Up certainly will. Here you get a great deal of insight into how the scene was built up from what was essentially a series of gags that didn’t make it into the finished film. The technique Docter, Peterson and the artist constantly hewed to was the paring back of extraneous moments that did nothing to propel the story forward or inform us about the characters, and here you can see just how brutal they can be with their own work when editing during production… yanking some funny moments from the script, or pulling near complete scenes when they felt they went beyond their purpose. Originally a much longer and elaborate sequence, the finished bit is proof that the folks at Pixar know when to reign in the impulse to over-indulge (unlike the author of this article… natch), while still providing plenty of detail and emotional heft for audiences to enjoy. Up Promo Montage (6:00) — Various walk-on/walk-off promo clips of the characters… cute stuff, this is what Pixar’s ads are made of. Global Guardian Badge Game (via BD-Live) — Russell narrates a geography-based game for the wee ones. The game has a learning mode prior to actual play. Up in standard-def. Nice to have for those showtimes in the mini-van or kid’s room. Looks better UPscaled to 720 or 1080ish. Digital version of Up ready to copy to a Mac or PC. 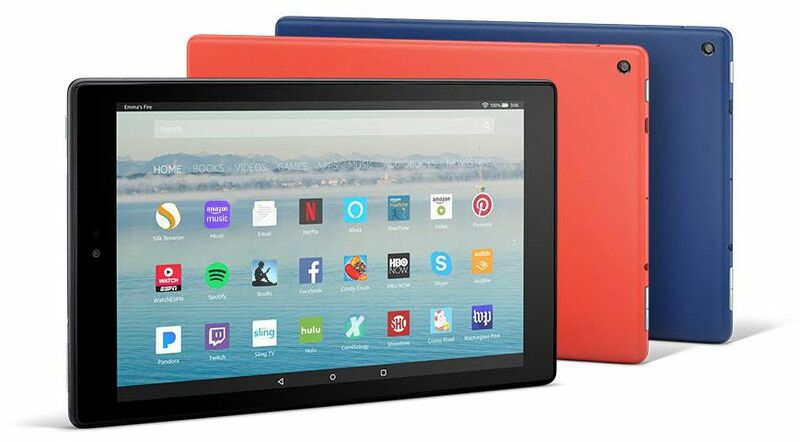 Compatible with iTunes/Windows Media capable devices only. 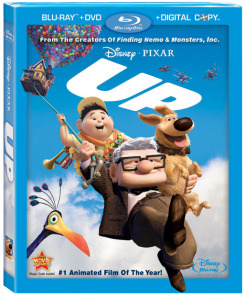 Up (4-Disc Blu-ray/DVD Combo + BD Live) | Reg. 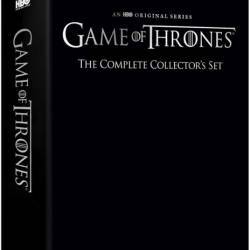 $45.99 | Sale: $17.99 | Available at Amazon.com. 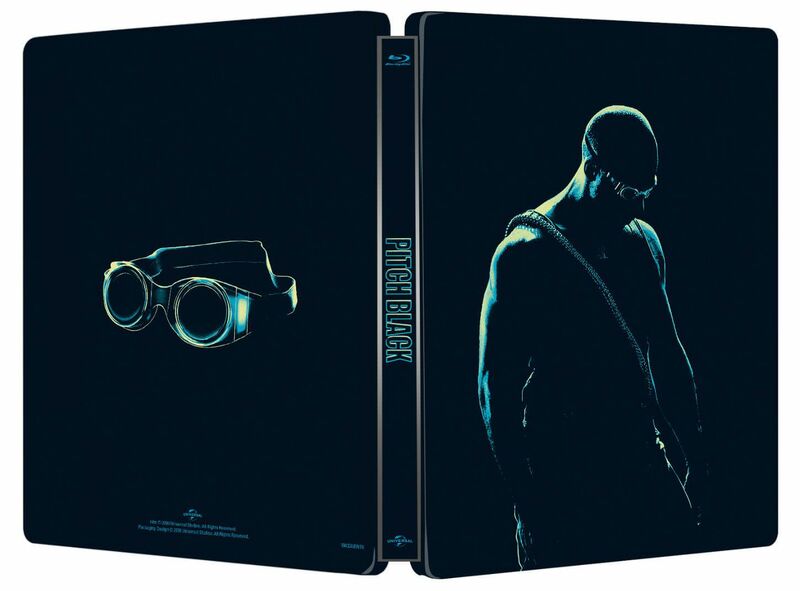 Next Next post: Blu-ray Picks Of The Week for April 13th.